BACKGROUND: Current literature on laparoscopic liver resection has focused on technical aspects and peri-operative morbidity. The aim of this study was to prospectively analyze oncologic outcome in a group of patients with malignant liver tumors. METHODS: Within a 2.5-year period, fifteen patients with malignant liver tumors underwent laparoscopic liver resection using a variety of techniques. These patients had liver only disease on preoperative CT scans as well as PET scans in 5 patients. Tumors were peripherally located (segments 2, 3, 4b, 5 and 6). All patients were followed up systematically under a protocol with quarterly CT scans and tumor markers. All data are expressed as mean±standard error of mean. RESULTS: Mean age was 65.4±2.4 years. Pathology included colorectal metastasis (n=11), HCC (n=3) and GIST (n=1) metastasis. Fourteen patients had a solitary lesion, with one patient having 2 lesions. Mean tumor size was 3.0±0.4cm. Liver metastasis was synchronous in 8 and metachronous in 4 patients. Seven of 11 patients with colorectal metastasis received preoperative chemotherapy. The patient with GIST metastasis received preoperative imatinib. The procedures were performed fully laparoscopic in 6 patients, hand-assisted in 8 patients and using a hybrid technique in 1 patient. Procedures included right hepatectomy (n=1), left lateral sectionectomy (n=6), right posterior sectionectomy (n=1) and segmentectomy (n=7). Mean operative time was 194±16 minutes and estimated blood loss 265±111 ml. Mean surgical margin was 0.9±0.2 cm and microscopically positive in 2 patients. Resections were performed either using a technique of pre-coagulation with radiofrequency ablation (RF) catheters or post-coagulation with the TissueLink to achieve a greater functional resection margin. Hospital stay was 3.0±0.4 days. During a median follow-up of 17 months, all patients were alive. Three patients (colorectal, n=2 and HCC, n=1) developed new liver lesions and 1 patient pelvic recurrence. There were no recurrences at the resection margin. 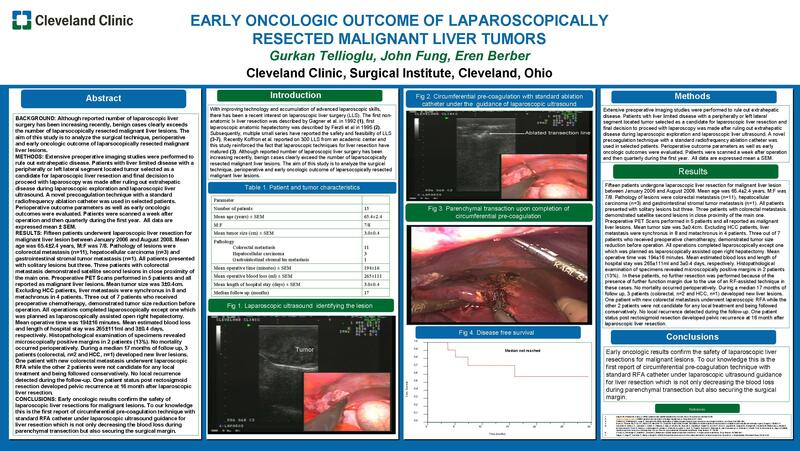 CONCLUSIONS: Although there is a relatively small number of patients with short-term follow up in this study, the lack of recurrence at the resection margin over time indicates that laparoscopic liver resection is oncologically comparable to open surgery. We believe that pre or post-coagulation with RF can potentially decrease resection margin recurrences. Close periodic follow up of these patients is essential to determine complete resection.